Trump says biggest wedge between U.S. and Russia is Mueller probe into Russian interference in 2016 election. U.S. President Donald Trump on Monday opined that Special Counsel Robert Mueller's "phony, witch hunt deal" was driving the U.S. and Russia apart. 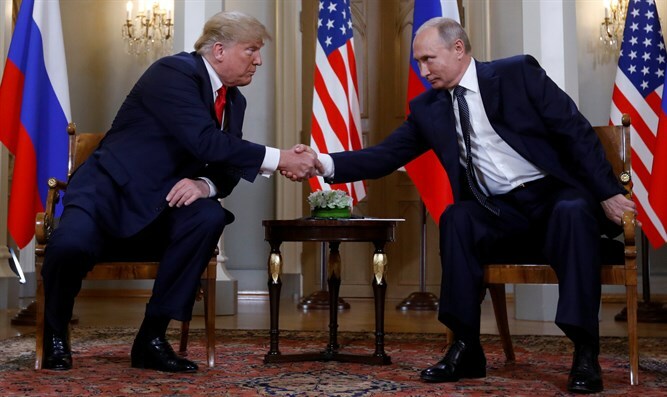 In an exclusive interview with Fox News' Sean Hannity following his meeting with Russian President Vladimir Putin in Helsinki, Trump said Vladimir Putin described the Mueller probe to him as "a shame" when the two leaders met. "He felt it was very hard for me to make a deal because of, you know, all of this nonsense," the president said. Mueller, who is investigating Russia’s interference in the 2016 U.S. elections, on Friday indicted 12 Russian intelligence officers in the 2016 hacking of the Democratic National Committee (DNC). The intelligence community believes the Russian efforts were intended to help elect Trump, a conclusion the Senate Intelligence Committee said earlier this month it saw no reason to dispute. Trump has dismissed that conclusion as a "fake news" excuse for Democrats for losing the election. Mueller is investigating possible collusion between Trump's campaign and Russia but Trump has reportedly been informed he is not a target of the probe. The President told Hannity on Monday that the biggest issue between Russia and the United States is nuclear proliferation, pointing out that the two countries account for "90 percent" of the world's nuclear weapons. "I know President Obama said global warming is our biggest problem, and I would say that no, it’s nuclear warming is our biggest problem by a factor of about five million," Trump said. "The nuclear problem we have to make sure, we have to be very careful." The president added that Putin told him that "he wants to be very helpful with North Korea." However, Trump said, "We’re doing well with North Korea [so] we have time. There’s no rush, it has been going on for many years." Trump also discussed FBI agent Peter Strzok's testimony before House lawmakers last week, calling him a "total phony." “If you think that Obama didn't know what was going on, when you watch and I said it today with President Putin, when you watch Peter Strzok’s performance, the lover of Lisa Page, when you watch that performance, the FBI – I’ll tell you, I know so many people in the FBI. These are incredible people. What they have to – what they’re going through watching this guy, a total phony,” he added.